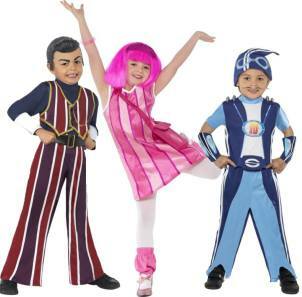 Promote Book Day AND healthy living with these fabulous Lazy Town Fancy Dress Costumes. For boys, there are two Lazy town characters to choose from - ideal for twin boys or best friends. They can choose to be super healthy hero Sportacus or go to the dark side and be junk food eating, exercise hating Robbie Rotten. The Kids Sportacus Costume includes a pair of blue trousers, a matching top with '10' printed on the front, a pair of arm cuffs and a hat with attached fake goggles. Price £24.49. The Robbie Rotten Costume includes a purple, maroon and white striped jumpsuit and a fabulous rubber top wig with forehead, eyebrows and rubber hair. Price £22.99. And for girls the Child Stephanie Lazy Town Costume includes a pink and purple striped dress, a pink bag and a pair of pink leg warmers. Price £16.99. The pink wig with headband is available separately for £6.99.